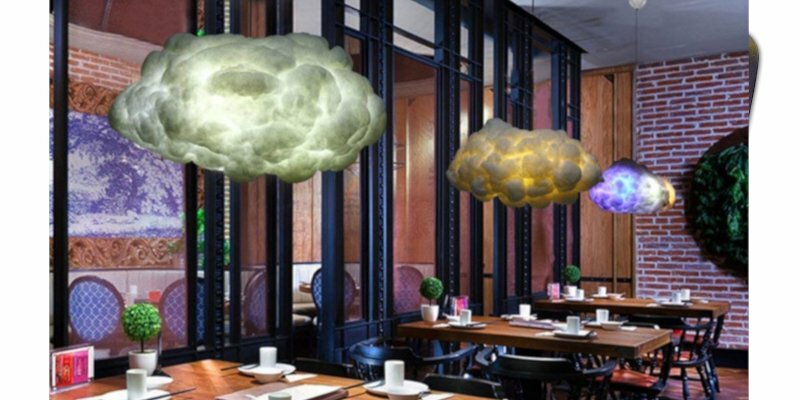 Creative shapes: Cloud, submarine, conch, mouse, sheep, coat, turtle pendant light, add a style to your room. Application: Ideal ceiling hanging light for living room, restaurant, hotel lobby, club, pub, coffee shop etc. Floating up near the ceiling, this lampshade is fluffy and round and magical, just like clouds should be. Why don’t meteorologists like to dine out on the moon? Because the moon has no atmosphere. That, friends, is a great joke. A joke with a wise word of wisdom: no one wants to hang out somewhere with no atmosphere. And that is the beauty of this simple but stunning lampshade: it brings an instant cosy and charming touch into the gloomiest and most boring of rooms! This means that you can bring those low-hanging thunder clouds right into your own house. This awesome meteorological phenomenon has been modified to float around your own ceiling. Hang it up in the living room, in a cafe or pub, a communal area, and wherever else could do with a bit of cosy mood lighting. The lampshades come in several authentically cloud-like colours and shapes. So you can drift off into your happy place and find all kinds of interesting shapes in the fluffy things above your head. Does that one look like a mouse? Or a giant, blobby alien invader? Or the proverbial sheep with no legs? Made of pearly cotton cloth, the clouds are very life-like, and will look amazing suspended in the air and lit up from the inside. If you get a whole host of them, you can recreate the whole sky indoors, which is really quite incredible. And what’s even more awesome is that each lampshade comes with a light bulb, and is easy and simple to install. Instant atmosphere!